Barbecue seems to be one of the most polarizing cuisines. There are so many different types and opinions on what makes good barbecue. We recently attended a media event to learn more about Famous Dave’s at Mesa Riverview. Not everything is as it seems at Famous Dave’s. You might be thinking to yourself, “Famous Dave’s is a chain, how good can it be?” Well, it is really fantastic! It always has been. However, now it is really exceptional. We tried the gamut of food from fried pickles to brisket to cedar planked salmon and everything was divine! The brisket was some of the best we’ve ever had and the salmon was melt in your mouth delicious. In addition to sampling the delicious offerings of Famous Dave’s, we learned a ton of facts that make it just that much better. Dave Anderson (founder of Famous Dave’s) spent 20 years perfecting his recipes before even opening his first location. The Mesa Riverview location is home to 2 Camelback Smokers designed by Little Miss BBQ’s Scott Holmes and John Ripple. The brisket is smoked solely with Oak wood and is seasoned with salt and pepper only. 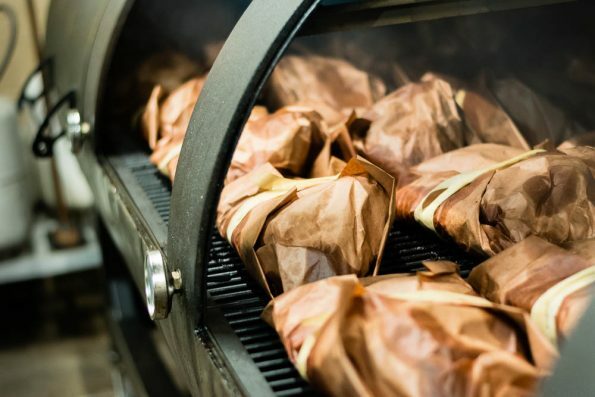 After smoking for 5 hours, the brisket is wrapped in a special unlined, unwaxed butcher paper that comes out of a single vendor in Austin and is cooked for another 10 or so hours. The paper keeps the juices in the brisket rather than losing them to the smoker. Famous Dave’s uses the prestigious Creekstone Farms for their brisket. The meat is hand selected, responsibly raised, and never frozen. The ribs at Famous Dave’s come a butcher in Minnesota who selects the racks specifically for Famous Dave’s. Famous Dave’s smokes their ribs with hickory and follows competition standards that ribs should be tender to the tooth but not fall off the bone (this means they are actually over cooked). The chips that diners are given to munch on are made fresh several times throughout the day. Famous Dave’s tries to make as much from scratch as they can, including their sides like their Wilbur Beans which use pieces of hot link and their wonderfully decadent bread pudding. As you can see, we learned a ton! Not to mention, we ate a ton! 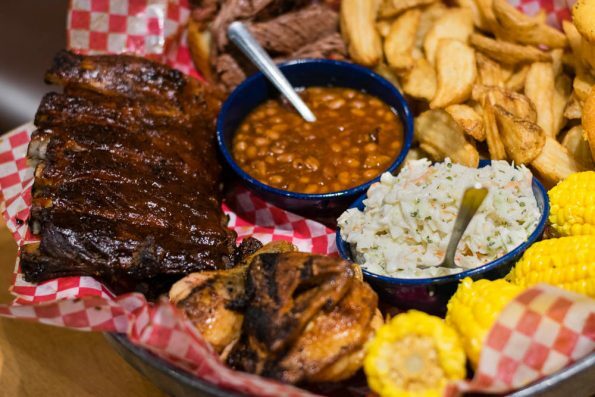 Next time you’re looking for barbecue, head over to Famous Dave’s and you won’t be disappointed! Where do you love to get barbecue? Have you been to Famous Dave’s? What is your favorite item on the menu? We’d love to hear all about it! Leave a comment below or use the hashtag #GeekEats!